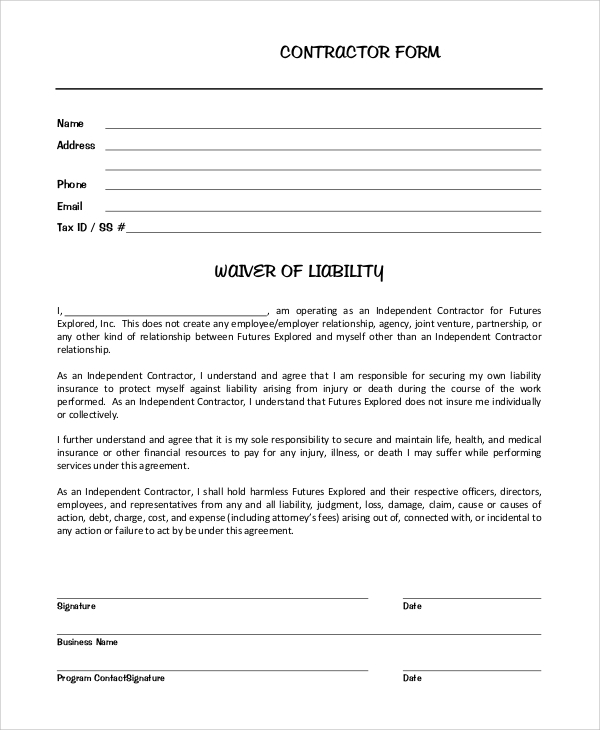 A waiver of liability is a contract agreement signed between a person or a group of individuals and a product or service provided, with the understanding that the liability of the service provider will not exceed the amount of compensation as stated in the agreement or as per the prevailing law in the territory where the agreement has been signed. 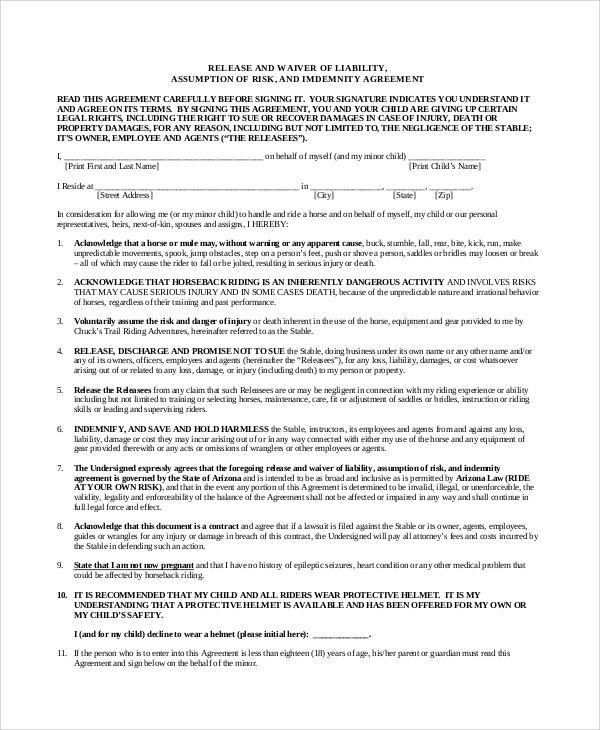 This is a list of Sample Liability Waiver Forms that will give you an idea of what these are. 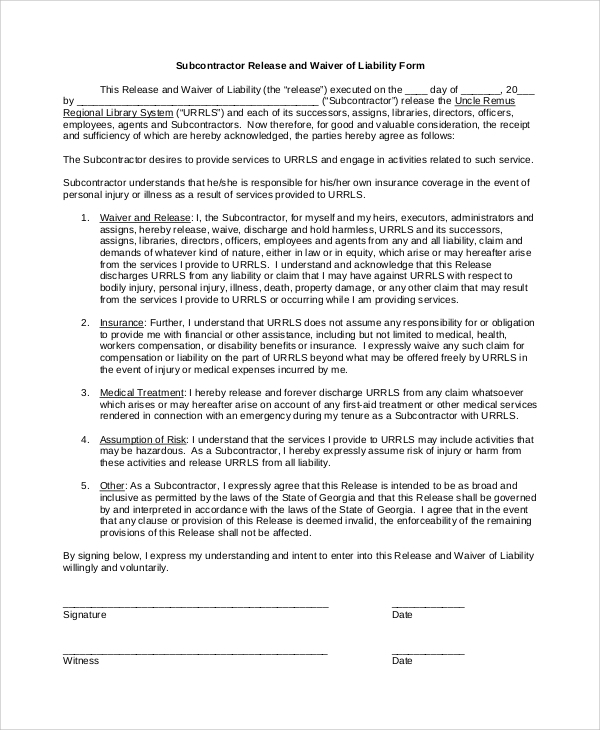 A release of liability waiver form is an agreement that is signed with the understanding that the product or service provider will not be responsible for any damages, physical or otherwise, by consuming the product. Such an agreement releases the product or service provider from the responsibility for any accident or damage which an employee may have suffered, legally placing the responsibility of the accident on the one who has suffered the accident. You can also see the Medical Waiver Forms. A waiver of liability and hold harmless agreement is a type of agreement which is signed with the understanding that the government or any of its institution is not responsible for any damages, and maintaining it harmless legally. The Liability Waiver Samples are useful for all kinds of organizations, but especially those that deal with inherently risky or dangerous products and services. 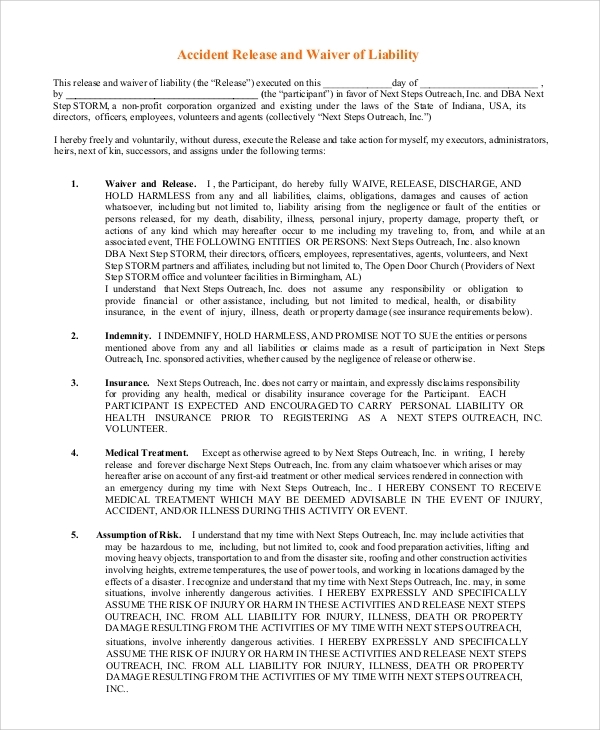 Such an agreement ensures that the issuing organization is not held unjustly responsible in the event of an accident that results in the injury or death of an employee when the employee or service provider signs the waiver of liability agreement with the full knowledge and consequences of being a part of the said organization. In this way, waivers of liability forms are a useful tool for such an organization, allowing them to function smoothly. A Sample Liability Release Forms is an agreement which is signed under the understanding that the organization, whether governmental or non-governmental, is not responsible for any damage or injury incurred by a willful participant. 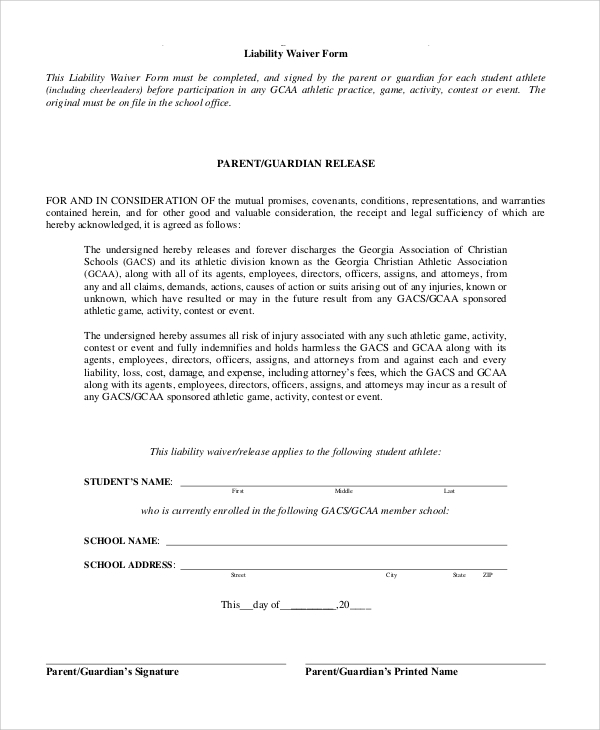 A subcontractor waiver of liability is an agreement that has been signed by a subcontractor before they begin their service in an organization. 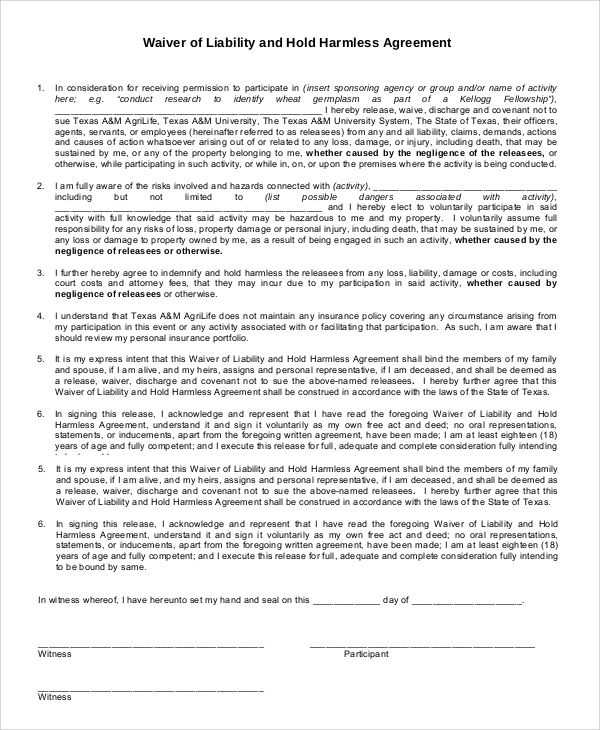 They sign the form as a precondition for their service. The sample waiver of liability forms is aimed towards organizations that deal with products or services that may lead to the injury and death of the consumer or employee. The organization wishes not to be held responsible for any accident or damage which the contracting consumer or employee has incurred, knowing fully well the associated risks and dangers. It is also aimed towards the signatories to remind them of the risks they are undertaking by signing it, thereby preventing any unnecessary expenditure on the part of the enterprise in legal cases involving indemnification and compensation that a consumer or employee has suffered. We have large variety of Liability Waiver Samples that can be chosen according to your need. The samples are completely editable and necessary information cam be filled in the template as per the purposes of the user. 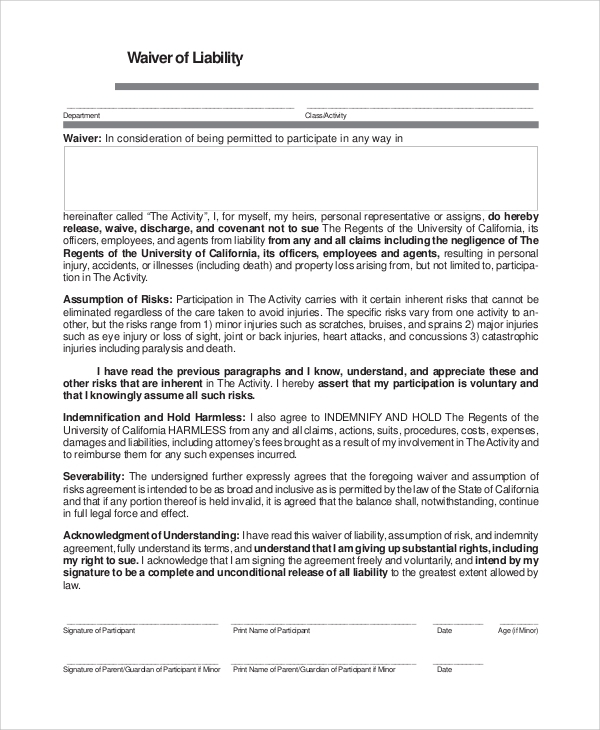 The sample templates can be used as a guide for creating your own waiver of liability forms.